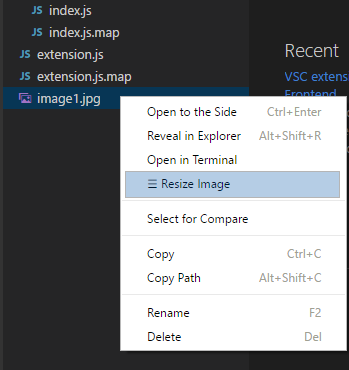 Visual Studio Code>Other>Image Resizer - Resize from the menuNew to Visual Studio Code? Get it now. Resize PNG, JPEG or BMP images from the explorer menu. Resize Image from the explorer menu. In quick open (ctrl/cmd + P), run: ext install lukapetrovic.image-resizer, or see it in the marketplace here.